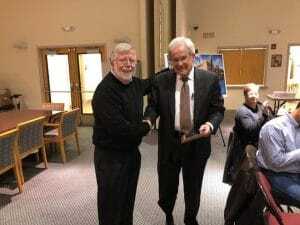 Dave Workman (left) is presented with an award for his long service by Board Chair Herb Schneider. As a not-for-profit organization, Project Freedom is governed by a 21-member Board of Trustees. 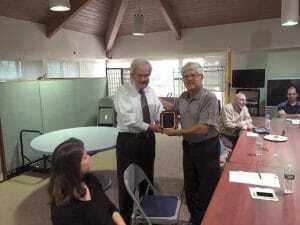 Recently two dedicated members of the Board stepped down after long service to Project Freedom’s mission. Dave Workman served as chair of the Finance and Golf Committees and served on numerous other committees as needed. Under Dave’s leadership, the annual Golf Outing turn into a major success in rising funds. Doug Heppe shared his expertise in housing development as he served on the Facilities Committee helping to bring new complexes through the various stages of development.